This article is 3154 days old. A couple of weeks ago, there were reports from the organizer’s of the Downtown Windsor Farmers’ Market claiming the city has outright refused to lease them the old bus station on University Avenue East. The city denied these accusations, but wouldn’t reveal what plans they had for the lot. Now, with the release of the city’s “culture hub” plans for the Armouries, we understand that they want to demolish the station and turn the space into a parking lot. Today, a campaign called “Incorporate The Station” is being initiated by Chris Holt of Scaledown. 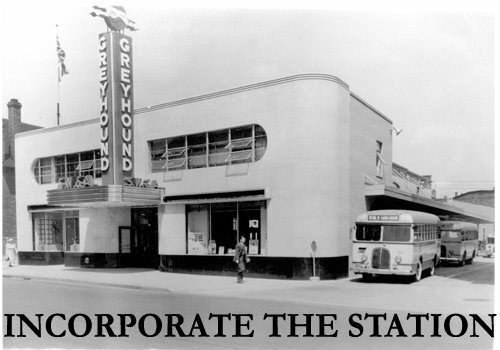 He’s asking anyone concerned to grab this image of the bus station (seen above), make it your Facebook profile picture, and change your status to “INCORPORATE THE STATION”. Holt would like the culture hub planners to consider using the bus station in the new design, rather than raze it needlessly. Planners have said they’re open to it, and Holt wants to show the city how many people support this idea. If you feel that Windsor has enough parking already, or if you feel that a historically significant building shouldn’t be sacrificed, or if you feel the “culture hub” would be even better with the inclusion of the bus station, or if you feel the opaque manner in which the city has handled this situation is wrong, then grab the pic, change your status, and help make a difference.